Back in May 2016, OSEIA kicked off a six-month process where solar industry folks contributed policy ideas and then ranked them. About two dozen specific ideas ended up being thrown into the mix and the ranking reflected the top priorities for the industry. It’s important to note that the Oregon legislature is going to be dealing with thorny budget issues. Unfortunately, our top priorities involve money. That just means we will have to present a very good case to legislators. And we have a good case to make. Extend the Residential Energy Tax Credit (RETC): RETC is set to expire at the end of 2017. OSEIA will seek to extend the RETC to align with timelines set for the federal Investment Tax Credit (ITC). The co-chairs of the joint legislative committee on Oregon Department of Energy oversight have published a draft recommendation to extend the RETC for 2 years. While that’s not long enough, we appreciate the good starting point for the conversation. But make no mistake, extending RETC will require a mountain of support. Connected to the RETC, we are exploring ways to also have something like RETC be applied to community solar. This is a very popular policy position but its success will all depend on its price tag. Extend the Property Tax Exemption for Solar and Other Renewables: Currently, any renewable resource that offsets onsite energy usage is exempt from being included in any additional value its installation bring to a property. This exemption ends at the end of 2017 just like the RETC. While it applies to any onsite renewable resource, it particularly impacts solar. We will make the argument that the foregone revenue from the exemption is a solid investment to drive new solar development. Ensure Successful Implementation of the Large-Scale Solar Incentive: In 2016, the legislature adopted a production-based incentive for solar projects between 2MW and 10MW. Business Oregon, the state agency charged with implementing the new incentive program, took several months to hire a person to coordinate the program. That person was finally hired last month and has been working furiously to bring the program online in time to meet the January 2, 2017 application deadline required in the law. We’re keeping our eye on the program to make sure it is able to incent the full 150MW of large-scale solar that it targeted. If we fall short of that target, we may ask the legislature for additional time. There are other items on the policy agenda. You can look at the whole thing (here). Other issues will also come up during the course of the session. We’re in for quite a ride. We’ll keep folks posted along the way. Lastly, don’t forget to put Tuesday, April 18, 2017 on your calendar. 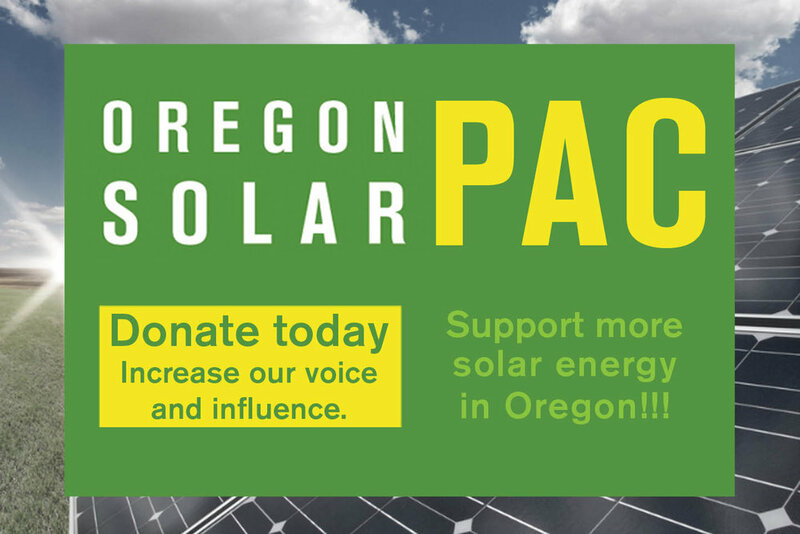 That’s Solar Lobby Day in Salem and we’ll need all hands on deck!